You may have created a PDF file with information that you don’t want to share with everyone. Especially, if you want to send that PDF file as is, that information may be revealed to third parties. The only way out is to make sure that the information is redacted. Redacting PDF files will ensure that the information is protected against unauthorized access. So what are the available PDF redaction tools for protecting your PDF documents? You might look for a PDF redaction tool for free but no luck. Unfortunately, there are no free PDF redaction tool and no open source PDF redaction tools. While no worry! Here we will introduce you to a powerful PDF redactor - PDFelement Pro that enables you to redact PDF easily and safely. PDFelement ProPDFelement Pro ranks top among the best tools that you can use to redact your PDF files. This software allows you to highlight confidential images and texts in a PDF document and mark them in a way that maintains their confidentiality. It beats others because it allows you to do batch-redaction of the information in your PDF. Besides PDF redaction, the program also comes with many editing tools that allows you to convert PDF to editable formats; edit and convert scanned PDF; compress, split and combine PDF; control PDF pages and documents; and fill out PDF forms effortlessly. Allows you to search text that you want to redact. The program supports redaction for selected items in PDF. Comes with many editing features for editing texts and images, deleting objects, adding comments and much more. It also allows you to create, fill-in, sign and send or share PDF forms. Edits PDF and converts PDF files to other formats like Excel and Microsoft Word. First, process PDF redaction software free download on your Mac. Install it by dragging the downloaded program file to the "Applications". And then launch the program. On the program’s interface, navigate to the base on the right side and click on the "Open File" icon. Then, select the PDF file that you need to redact. After you have selected the file that you want to work on, click on the "Open" icon. The PDF file will be imported to the program for redaction. 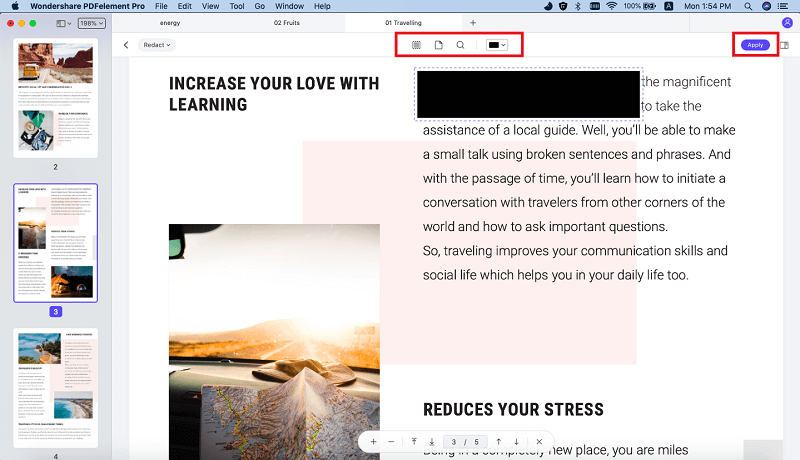 As stated earlier, you can redact texts, images, and pages on a PDF file. To get started, go to the toolbar and click on the "Protect" tab. After that, click on the "Redact" option to select the content that you want to be redacted. The areas that you have marked for redaction will be surrounded by a black box indicating the content that will be redacted. You will need to verify the area as your intended redaction content. After verifying, proceed to click on the “Apply Redaction” option to start the redaction process. Immediately, the section will turn black in color. However, you can change the color of this portion by clicking on the "Stoke Color" option. You will need to save the PDF document that you have redacted to effect the redaction.